Our journey from Brighton was easy, with a change at London Bridge for North Greenwich. Walking out of the tube station, we saw the impressive structure emerging in the distance. 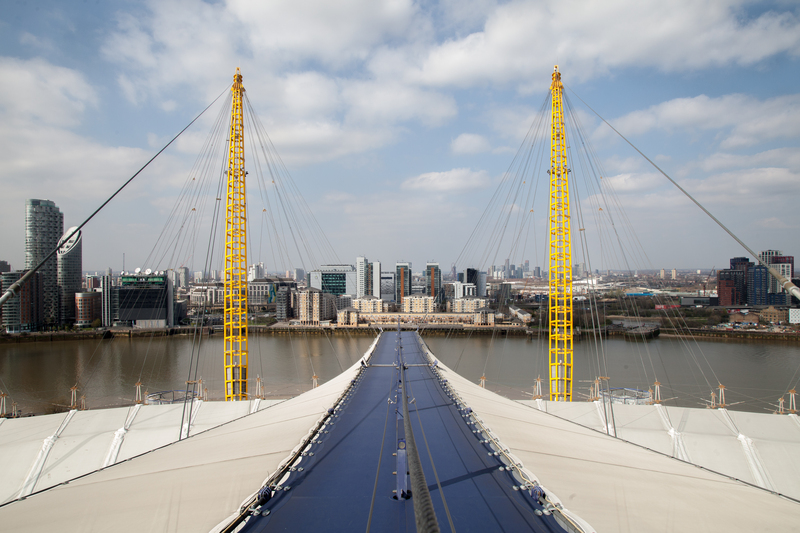 With its white dome and distinctive yellow pillars, there was no mistaking the iconic O2 building. To add to our excitement (or, let’s be honest, sweaty palms), we could just about make out the far-off figures of participants beginning their climbs. Eek! That would be us soon! Next, we were shown to the changing area and given a choice between an astronaut-style full-body suit, or a sleeveless gilet. Both keep you the right amount of warm depending on the season, and have small zipped pockets for your mobile phone. Think of these as the Spring/Summer and Autumn/Winter collections for Up At The O2. With it being the first warm day of the year, both Garry and I opted for the gilet. Next, Natalie helped us into our climbing harnesses and special gripped climb shoes. We passed her our bags and valuables to be stored in a locked box while we climbed. She then attached a special climbing rig onto our harnesses, which is what we’d use to guide ourselves up the building. It was time for our adventure to begin! Natalie took us up the stairs leading to the first viewing platform, double-checking our harnesses were tight enough before we began the climb. As we reached the platform, there was a bubbly photographer waiting to take our picture. Her energy was infectious as she darted around and told us where to stand, and it was difficult not to feel excited about what was to come! As we began our ascent up the first side of the building, we were both struck by the unique texture of the climbing surface, and Garry remarked that it felt like a bouncy castle. Natalie showed us how to hook our climbing rig onto the pole that runs over the top of the building. There was definitely a knack to this – and one I’m not confident I ever completely mastered! Luckily, Natalie was always on-hand to help, and never rushed us. I’d say this first part of the climb was the most physically challenging as it was up-hill, but it’s not enough to wipe you out. Think gentle trek, not exhausting slog. There really is something to be said for getting the heart-rate up while taking in the fresh air, and I could feel the benefit of it as we walked. 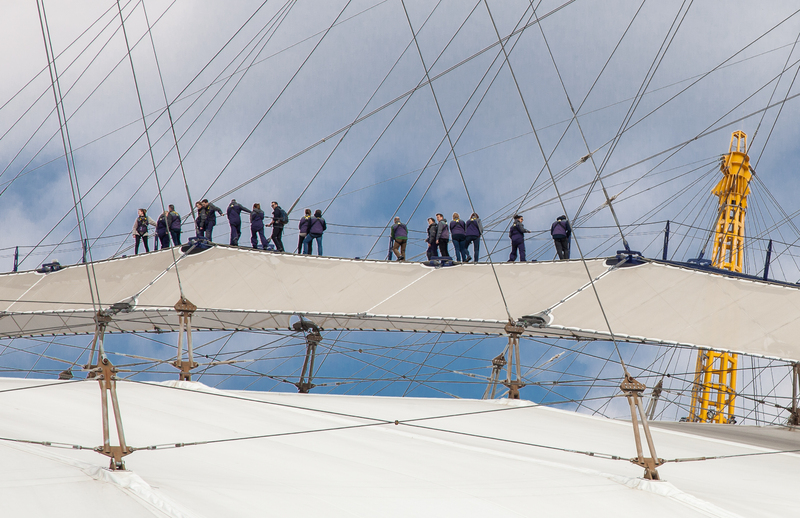 Natalie joked that for her, ‘every day is leg day’, as her whole job is to guide climbs up the O2. I can only imagine how much fun she has on a daily basis! As we neared the summit, it was amazing to feel and hear London all around us, from the landmarks that sprung up in the distance, to the honking sound of traffic, to the cool feeling of wind against our faces. Seeing London right behind Natalie as we climbed and chatted was incredible, and felt like being on top of the world. The timing was serendipitous as we reached the top, with the sun seeming to come out just for us. We stood on the viewing platform, and Natalie exercised her extensive knowledge of London by pointing out notable landmarks surrounding us. She pointed out the Isle of Dogs – no, not the Wes Anderson film, but the patch of land on which Henry VIII supposedly kept his excess of hunting dogs when there got to be too many for his dwellings. (Ugh, Tudor problems, am I right? We’ve all been there.) She also pointed out Canary Wharf, so named because it was originally used to store shipments of bananas from the Canary Islands. There were plenty of other facts and nuggets of history that Natalie told us, but I don’t want to spoil it all in advance, as learning these while being there yourself is one of the fun parts of the climb! Natalie told us that they climb in all sorts of different weather conditions, and joked that in order of things closing due to the bad weather it goes: airport, then cable cars, then Up At The O2. It really seemed like the experience was for everyone, and Natalie told us that they offer wheelchair climbs for disabled customers. 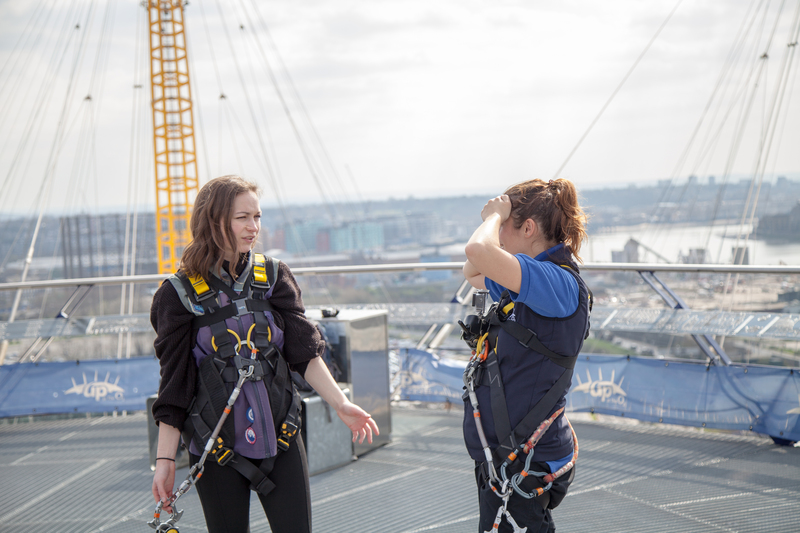 We thought this was a great way to be inclusive and ensure that everyone can experience the exhilarating feeling of Up At The O2. 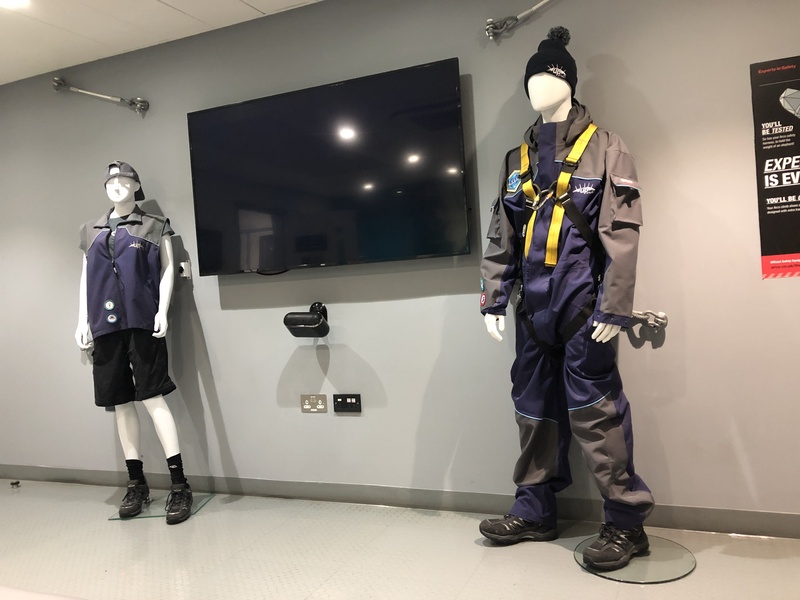 Once we got to the changing rooms, Natalie retrieved our belongings from the secure lockers, and we got changed out of our urban mountaineer uniforms. Back in our boring street clothes, we said thank you to Natalie and left for the second best part of the day: our meal! All Bar One is inside the O2, so it was easy to get to from our climb. As we walked in to the bar, we were greeted by a friendly waitress, who showed us to our reserved table. We had a look through our set menus to choose our 2 courses. I’m vegan, and both myself and Garry have a sweet tooth, so I was very impressed to see a vegan dessert on the menu and happy that I got to join in with, let’s be honest, everyone’s favourite course. Garry ordered a cheeseburger and a brownie with ice-cream to follow, while I opted a vegan burger and vegan chocolate pudding. Veganism tends to be a lot of couscous and fruit salads when eating out, so it was nice to be able to enjoy a classic pub meal! Once our orders had been taken, we relaxed and enjoyed the atmosphere of the bustling bar, looking through the photos we had taken of our experience. This meal was a great chance to decompress after our adventure, and we were definitely both ready for some food. We were happy to see our burgers arrive quickly, and found it difficult to resist tucking in straight away. But we work for an experience gifts company, and we were there to document our experience after all, so I allowed my burger its close up before diving in. There was plenty going on in my burger, and the different imaginative flavours had been paired extremely well. I also appreciated the fact that the patty had a lovely crispy texture. Certain vegan burgers, not naming any names, perfectly replicate the experience of chewing a shoe insole. I’m happy to report this was not the case with the beetroot and harissa burger, which was delicious. We hoovered up our food, and just about had room for dessert. Mine was small but perfectly formed: a rich, creamy chocolate pudding decorated with fresh blueberries, strawberries and grapes. It was a lovely dessert, and so I made the effort to savour it rather than shoving the entire thing in my mouth all in one go like a cartoon character. Garry’s warm brownie with ice cream also looked great. (I mean, you just can’t go wrong with a brownie, can you?) After our meal, we felt full, exhilarated and happy, and made our way back to the train station buzzing with the memories of our experience. 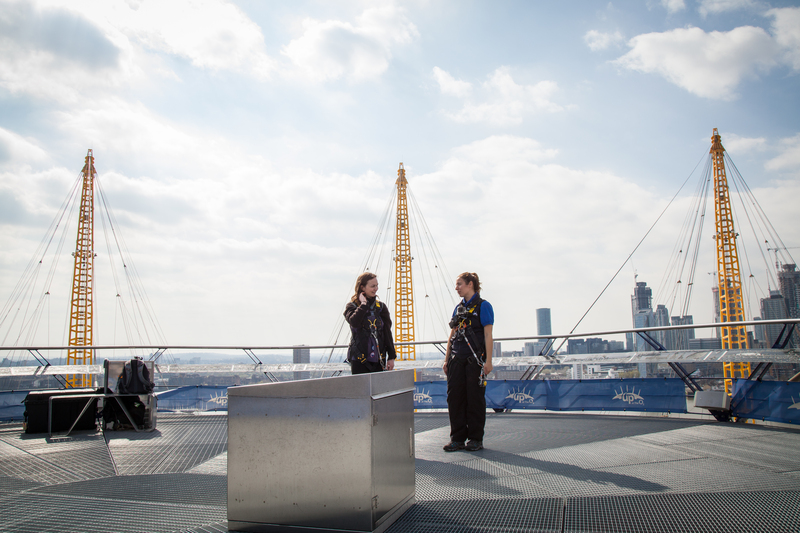 We want to say a huge thank you to all the staff at the O2 who organised and helped with our climb, and to Natalie for being such a great guide. Thanks also to the fantastic staff at All Bar One for a delicious meal. 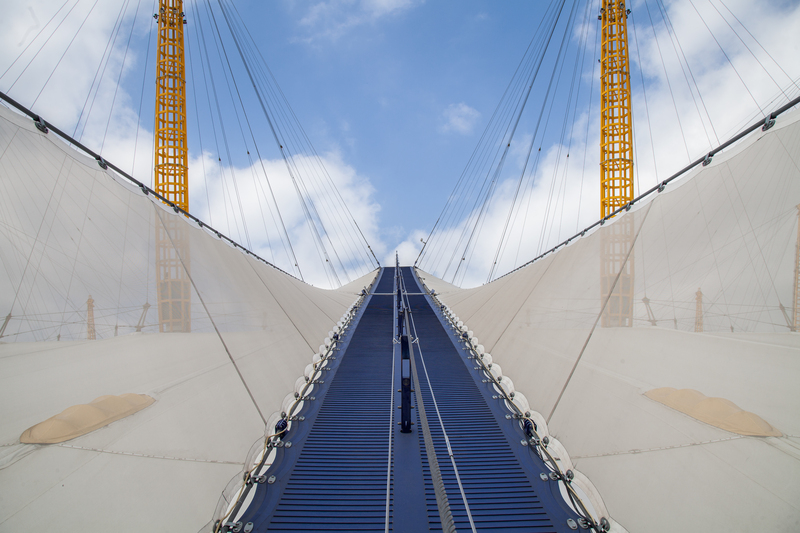 I would definitely recommend the Up At The O2 Climbing Experience with 2 Course Meal for 2. 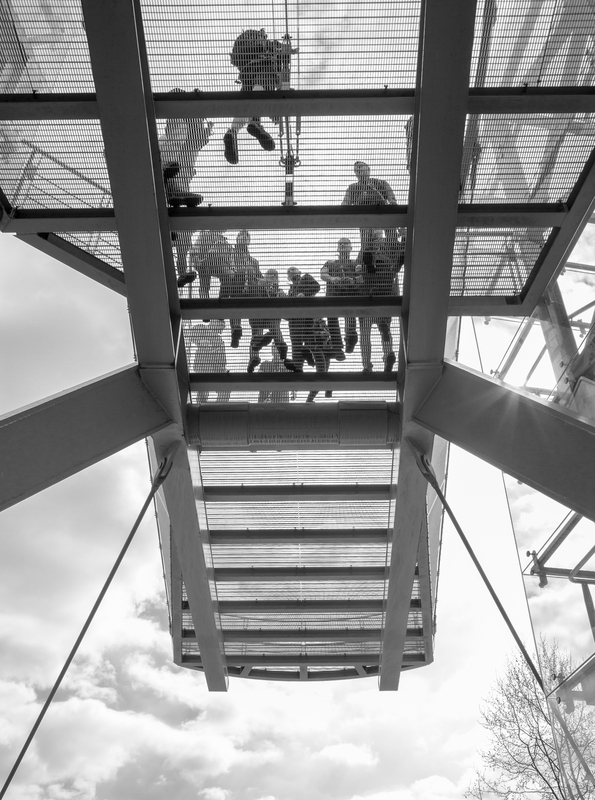 It’s a great way to experience London, and don’t let the height put you off – if we can do it, you can do it!